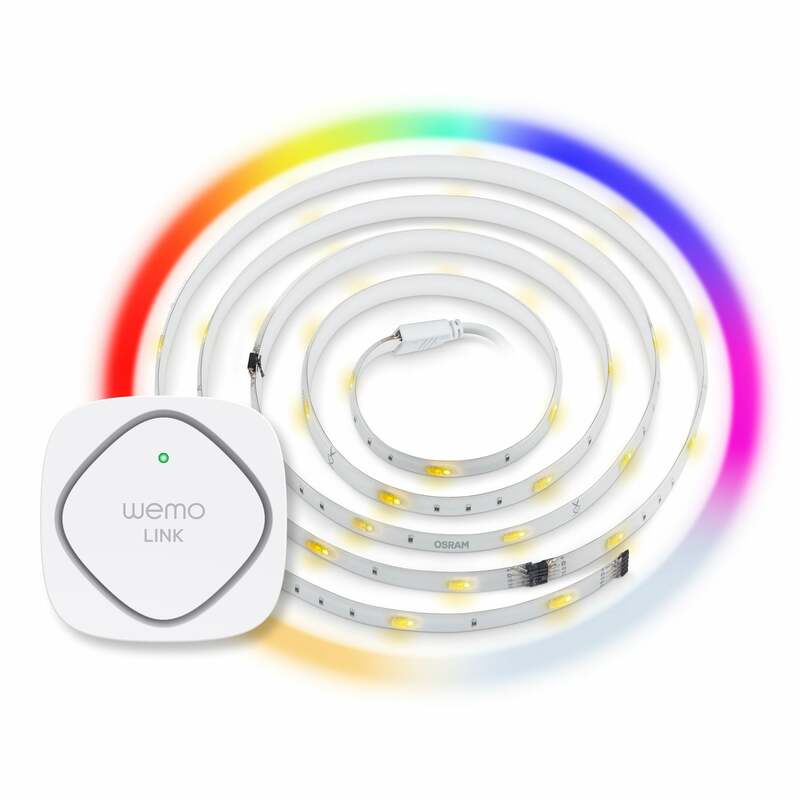 Expanding on a partnership established in September 2014, WeMo builder Belkin and lighting manufacturer Osram Sylvania have introduced a troika of smart-lighting starter kits that combine the former’s WeMo Link hub with the latter’s connected luminaires. Belkin’s WeMo technology works with a number of other third-party products, including a coffee maker and a crock pot, but this is the first time its devices have come in the box with another manufacturer’s products. The least expensive of these WeMo Osram Lightify starter sets includes two A19 tunable white bulbs in addition to the all-important hub. These are 60-watt-equivalent LEDs that can put out 805 lumens. A color temperature range of 2,700 to 6,500 Kelvin means you can alter the glow to suit your mood; cooler whites (3500K and up) are best for work, whereas warmer whites help you relax. This bundle will set you back $100. Next up is the $120 Flex RGBW Starter Set, which contains three 2-feet long light strips, WeMo Link, power supply, and controller. Ideal for decorative purposes, the color-tunable LED strips offer a fairly wide spectrum of colors and a broad range of whites (2700-6500K). The third bundle to go on sale is the $130 Garden Mini Starter Set. It includes a 14-foot string of colorful garden lights, WeMo Link, power supply, and a controller. Belkin says its Flex RGBW light strip can be used for a variety of purposes, including under-cabinet lighting or to enhance architectural details. 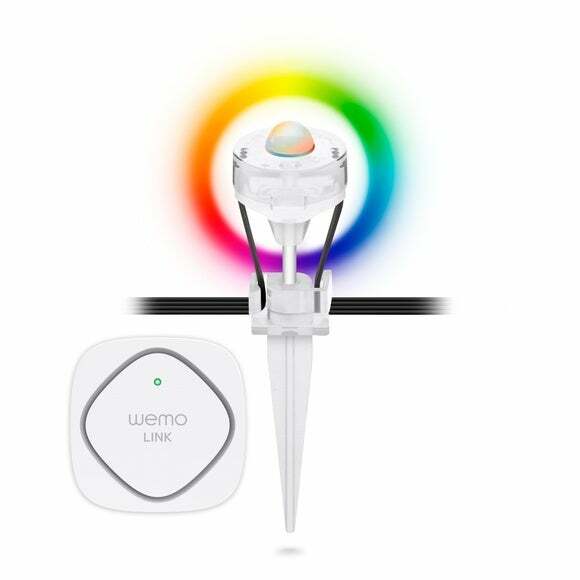 Essentially a Zigbee-to-Wi-Fi bridge, the WeMo Link enables up to 50 bulbs and lights to be controlled by the WeMo app. It was until now only available as part of a $50 bundle containing two WeMo smart bulbs, although it works just fine with a handful of Zigbee-speaking standalone lights from Osram and TCP as well. Why this matters: Belkin’s home-automation brand WeMo isn’t just limited to smart lighting, but is a fledgling ecosystem containing an array of connected-home products including cameras, smart switches, sensors, and small appliances. Integrating third-party products is key to its expansion, particularly in areas where Belkin has little or no expertise. In this case, for instance, two of the bundles include products Belkin doesn’t produce itself—landscape and decorative lighting.